I wanted something quick to post on my blog because I was tired of seeing the picture of Tuesday's Tax Day Snow. The weather has improved significantly and I no longer wished to be reminded of how cold it was just five days ago. So at first light, I grabbed my camera and headed outside to find a few flowers to post about. I snapped some pictures, moving around the garden in counterclockwise fashion, until I came to the garden border I call The Shrubbery. Something in that border caught my interest and I walked over to it, forgetting momentarily I was within five feet of the duck's nest under the spruce tree. Mama Duck (she needs a name!) saw me and she was not pleased. 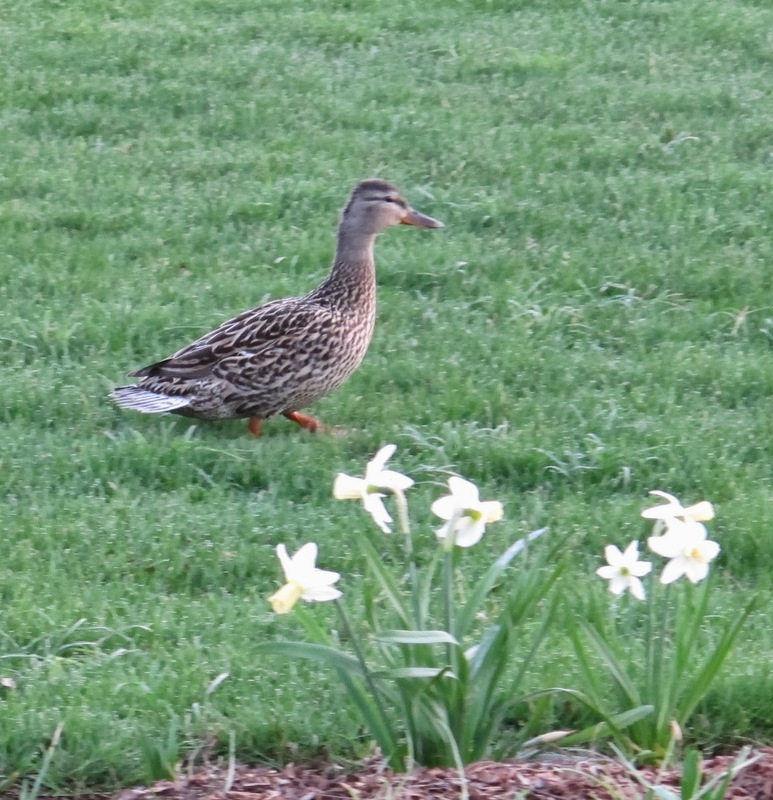 She hopped off her nest and started across the lawn in a huff. "My bad, Mama Duck (she needs a name!). I forgot about your nest. Go on back. I promise to leave it alone." Then, after snapping a few pictures of the duck (she needs a name!) from a safe distance, I went about my business of taking flower pictures and she presumably went back to her nest. The garden is picking up speed now, no doubt spurred into action by the warmth and sunshine. 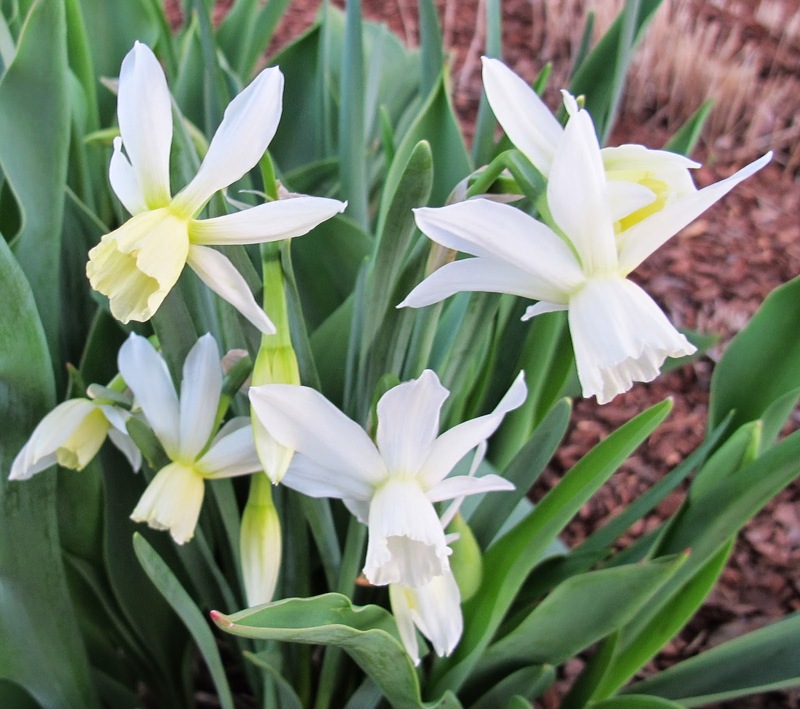 The daffodils are near peak of bloom and were not fazed by the Tax Day Snow. I like these daffodils in the front garden. But I like these even better. Remind me if I decide to buy more daffodils to get the paler colors. I like them better. Also, remind me about the duck (she needs a name!) on her nest under the spruce tree. I keep forgetting she is there, and she doesn't like it when I forget and get too close. Spring is on its way! I love your aerodynamic daffodils ! How nice to have a duck's nest in your garden (even if you get the occasional scolding for intrusions into her space)! Glad to hear your weather has improved. Your photos are lovely. Happy Easter. My second wave of daffodils are blooming. The first batch were an off-white color with a peach center. The new batch is yellow with orange centers. I love them, both! "Mama" is a fine name and will do for now. Great photo! 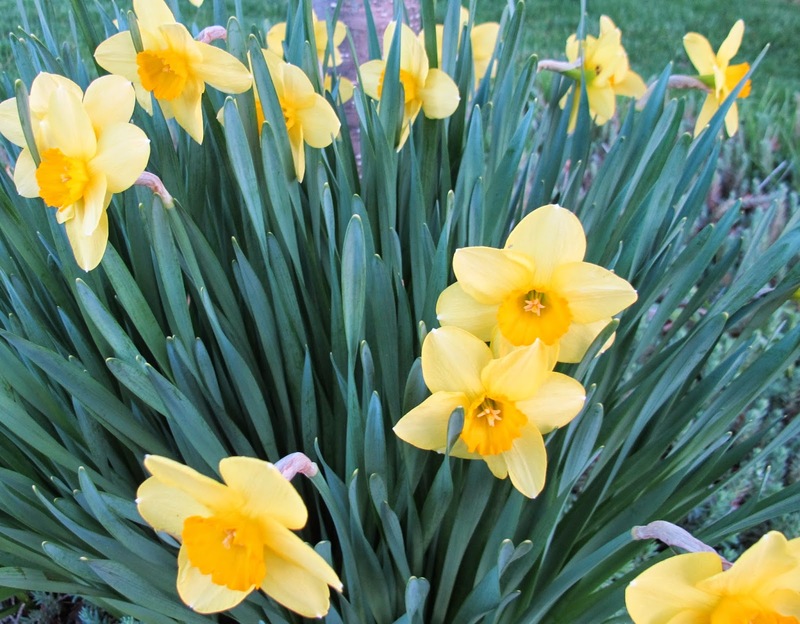 Daffodils are some of the first flowers to come up here in our area of New Jersey. Carol, isn't she Jemima Puddleduck? That's what she looks like to me. Remind me to get more two color daffodils. The pale ones fade into the background, but the if they have two colors, they just grab my interest. I miss the daffodils. It got so warm in Southern California that they bloomed super early. I am enjoying your photos!